Hardrick wraps up Michigan State player. 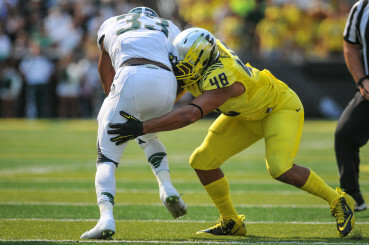 With the departure of linebacker Tony Washington, Oregon’s linebacking corps needs a new leader. Redshirt senior Rodney Hardrick has the ability to become that leader. 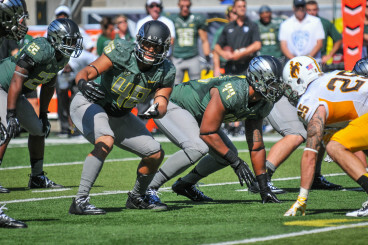 I met up with Hardrick to discuss what the future of Oregon’s linebackers looks like. Daniel: It is a very young linebacking crew with [Tony] Washington gone. What are the young guys doing in order to get ready? Hardrick: Just basic stuff and fundamentals. Daniel: How does it feel to not have him around anymore? Hardrick: I miss him; I hang out with him a lot off the field, on the weekends, barbecuing and stuff. Christian French, Tyson Coleman, those guys have stepped up a lot. He (Washington) was one of our quiet leaders; he led in a different way. Now we have new guys taking up that role. I miss him as a person, but I hope the best for him. Daniel: How is spring practice going? Hardrick: It is going really well. I watched all the film, identified all the areas I need to improve in, and I made that a goal. I have made progress this spring, as well as the other linebackers. We have all gotten a better knowledge of how to control the defense. Daniel: What have you been focusing on individually? Hardrick: The areas I want to improve on from last season are my footwork, which will improve my missed tackling. I am starting to let my feet do all the work, and let the rest fall into place. I am working on pass rushing when I get the opportunity to blitz off the edge. I have all the tools in my book to succeed. Hardrick controls the defense in the Wyoming matchup. Daniel: Any young linebackers stepping it up? Hardrick: Jimmie Swain has done really well this spring, so has Danny Mattingly. Our new walk-on, De’Quan McDowell has done well also. The group has gotten a lot better and has taken a new role, each person has improved in their own way. Daniel: How about the other side of the ball? Have any offensive players stepped up in your eyes? 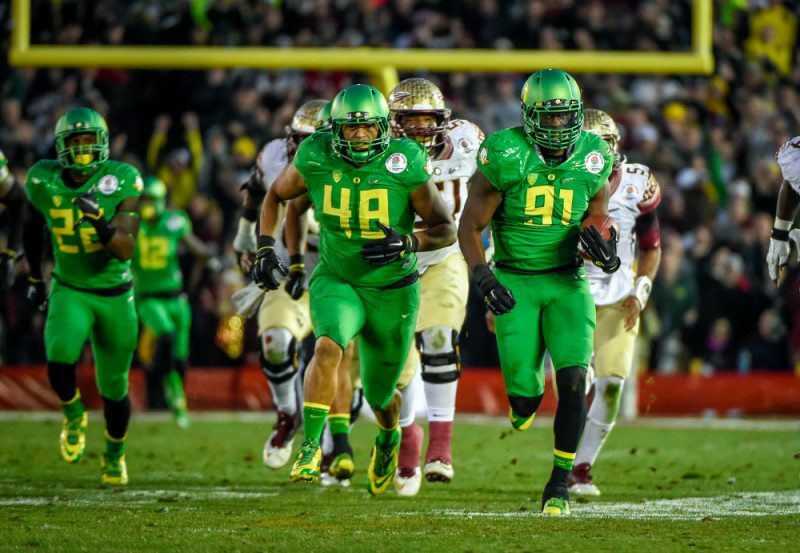 Hardrick: The first one that comes to mind is Royce Freeman. He reminds me of some guys we played last season, not going to name any names. He is such a great athlete; it is exciting to play against him every day. Daniel: Have you been focusing on the opponents for next year? Hardrick: Not at all. I feel like this time is for ourselves, and get better at what we need to do.